Alice Carls Ore died Friday, February 8, 2019, at Clark Lindsey Village in Urbana at the age of 88, from complications of dementia. She was born Alice Rose Carls in rural Cass County, Illinois, to William T. and Henrietta Carls on April 27, 1930, the eldest of nine children. She attended schools in nearby Arenzville and married her high school sweetheart, Fred Robert Ore, on May 3, 1947. The couple moved to Peoria and later to Urbana, where Fred pursued his college degree. During the Korean Conflict, they were stationed at Ft. Monmouth, NJ, where their first child, Fred Robert Jr. (Rob) was born in 1952. After leaving the Army, they moved back to Urbana, where, in 1954, their daughter, Peggy was born. The family lived in Cedar Rapids, Iowa for a few years, returning to Champaign-Urbana in 1961, where Fred joined the Department of Electrical Engineering at UI. 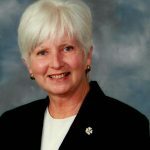 Alice began studies that year in the College of Education, receiving her BA in 1965, and later her MA in Special Education in 1968. She taught in Champaign Unit 4 schools for 20 years, ending her teaching career at Garden Hills School, where, as a Reading Specialist, she helped dozens of children learn to read. Alice left teaching in 1985 to work full-time in the family business, AF Antronics, Inc., manufacturing and selling telemetry antennas used to track wildlife. Alice retired in 1991 and pursued her many interests. She enjoyed ballroom dancing, bridge, golf, and spending time with family. She was a wonderful cook and was famous for her pies. She and Fred also traveled extensively all over the world, both with the Elderhostel program and on numerous cruises. Their most memorable travels were to Europe, Russia, and the South Seas. Alice had many friends from her teaching days, Galen Drive neighborhood, the Regent Ballroom, the University Club and the Windsor of Savoy with whom she remained close. Fred passed away in early 2011. Alice was also predeceased by her parents and four siblings, William Carls, Jr., James Carls, Ronald Carls and Mary Brannan. She is survived by four siblings, Kathryn Lovekamp, JoAnne Jacobsen, Patricia Wydell, and Kenneth Carls, her two children, Rob (Diane) Ore and Peggy Ore (Terry Hairrell), her grandchildren, Anna (Graham) Munson and Jacob (Jennifer) Hairrell, and six great-grandchildren. The family would like to express their appreciation to the staff at Meadowbrook Health Center for the loving care they gave Alice in her last three years. We are planning a celebration of Alice’s life sometime in the spring, location and time to be announced. Donations in Alice’s memory may be made to Alzheimer’s Foundation of America or the American Macular Degeneration Foundation. We shared many good times with Alice and Fred on the dance floor and on trips. They were really great people and friends to many at the Regent. They are remembered fondly. Alice was my father's Aunt. I remember the first time I met her over at Newt and June's house. I remember telling my mom that I thought she was so beautiful and so very nice. I only interacted with her a couple of times over the years but I could tell she was a really special lady. Peace be with you and your family.